André Cognard was born in France in 1954. He was 17 years old when he started teaching aikido by opening five dojos in several cities in France. Four years later, he received the French state diploma for teaching judo, aikido, karate and kendo. In 1973 he met Hirokazu Kobayashi Sensei (1929-1998), a direct disciple of O-Sensei Morihei Ueshiba. Cognard trained under Kobayashi Sensei for 25 years. 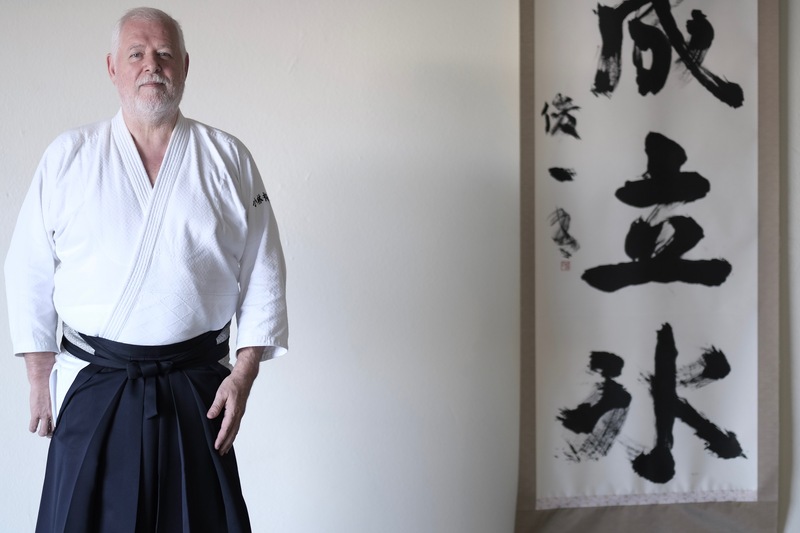 In 1982 he founded the Académie Autonome d’Aikido (French), where aikido is taught by traditional means as well as with support from research in psychology, philosophy, and western and eastern medicine. In 2003, he opened the Kobayashi Hirokazu Kinen Aikidojo in Bourg Argenal, France, which is a traditional dojo devoted to his master and the venue for his Instructors Training Courses. Cognard Sensei directs seminars worldwide, and he is the author of several books on martial arts. 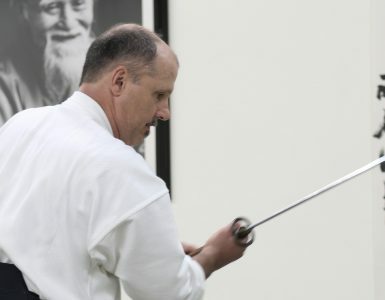 He is also one of the highest-ranking representatives of the Dai Nippon Butoku Kai: the title of Hanshi was bestowed upon him in 2012, at the Fourth World Butoku Sai held at the Butokuden in Kyoto, Japan. 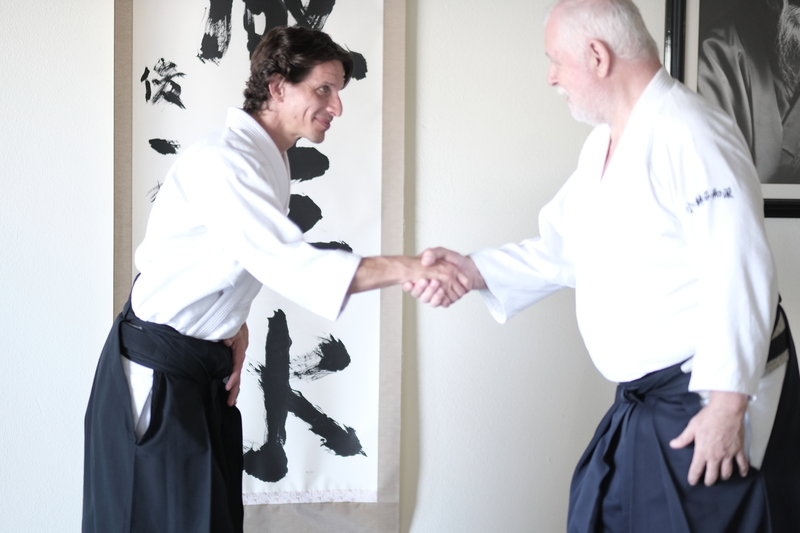 Aikido Journal (Josh Gold): If you were to talk to an aikido practitioner who wasn’t familiar with your work or Hirokazu Kobayashi Sensei, how would you describe the key defining elements of your system and practice? 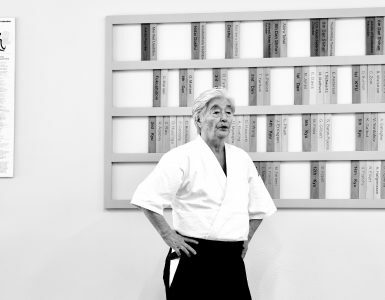 André Cognard: First, Kobayashi Sensei was always talking about individual freedom. It was very important for him not just as a personal philosophy, but also in the way he approached technique. In his mind, the practice must be able to lead you to the freedom. It wasn’t just about external freedom, like being able to freely take action in the world, but mostly about an internal sense of freedom. His teaching was also always about the spiritual way. The misogi [traditional Japanese Shinto purification ritual, often used in aikido] for example for him was a physical approach to spirituality; in this case, to get contact with the kami [spirits or gods in Shinto]. 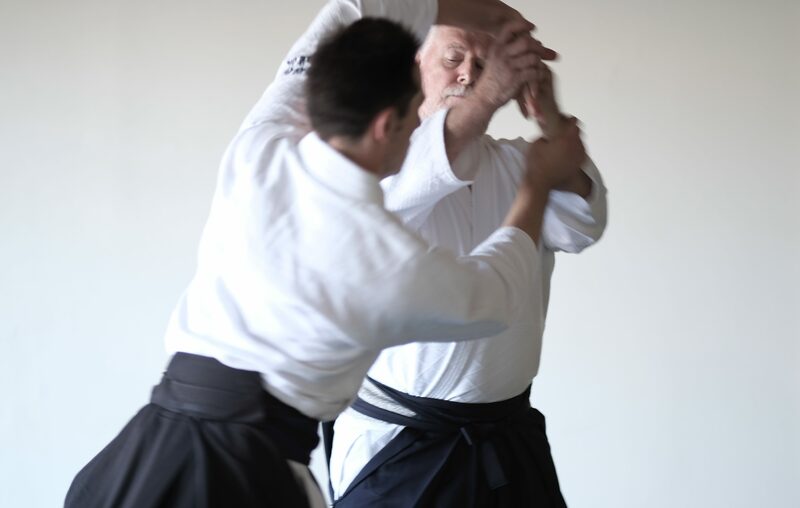 In the same way, an aikido practitioner’s technique and movements must reflect exactly the ethic and the philosophy of aikido, mainly this individual freedom. He said that if you are not free, you cannot be in peace, and aikido must bring peace. The second point is that is you don’t do aikido on your partner – you do aikido on yourself. That means when the partner wants to grab you or to attack you, first you don’t stay where you are. You move immediately, you change your position. You change the stance between your hand and your center, and you shift your body into a technique. I do the nikyo on myself first and then it will appear between me and the opponent. Once I do the configuration on myself, then it will probably engender change in his body as well. In a conflict, we are used to thinking that the opponent must change in order to ensure harmony, but in aikido we must think the contrary. If there is a conflict, that means two things. First, we have something to resolve together that we cannot resolve separately. Secondly, Kobayashi Sensei told me that when an opponent comes at me, I must change first. These are the fundamentals of his teachings about aikido. According to Kobayashi Sensei, how would the concept of individual freedom be expressed through aikido technique? It’s very interesting because he would demonstrate that his aikido was not constrained by the method of his opponent’s attack. If an attack was a certain way or another way, he showed that he could use several different techniques in response, so it didn’t really matter what the attack was. In fact, thinking about aikido as a certain technique to defend against a certain attack was not correct to him. Never defend – this was very important. You must never defend, because if you defend you can be defeated. He was not happy when he heard people say aikido was about self-defense. To him, it was the opposite. If you are in a defensive mindset, that means you’ve already given up some freedom because your response is constrained by the attack. Kobayashi Sensei was always talking about individual freedom. It was very important for him not just as a personal philosophy, but also in the way he approached technique. In his mind, the practice must be able to lead you to the freedom. Additionally, he said that there was no single right way of moving; for each technique he showed us many ways to perform it. This is how he showed us the way of practicing aikido that creates freedom. As I mentioned, he started with a spiritual approach: your spirit must be free, and then your mind will become free, and then your movement will become free. It was very interesting because when you saw him move, it was just like a dance. Of course, it was difficult to try to do it yourself afterwards. When you talk about different ways of moving based on an opponent’s attacks and responses, are you referring to henka waza, or transforming one technique into another? In your practice system, how is that integrated into the curriculum? First, I have to show people that techniques are not discrete, unrelated things – they are all connected. Nikyo is the mother of sankyo, and ikkyo is the mother of nikyo, and anytime you perform any technique, its opposite is simultaneously reflected somewhere else. So if I do a nikyo on me, it will be a kotegaeshi in front. If I go from nikyo to kotegaeshi, this becomes nikyo on my opponent. To really understand this, you must experience it. That can be the most difficult part, because often when people try to do it they can’t because they keep their opponent at a distance physically. They don’t want people to enter in their personal space, and that’s understandable, but Kobayashi Sensei was very clear on this point: people must come in your center and you must let them come to you in the fullness of who they are. It’s not about keeping people on the outside. He was telling me about O-Sensei’s approach to irimi – to take your partner into you and let him come close. 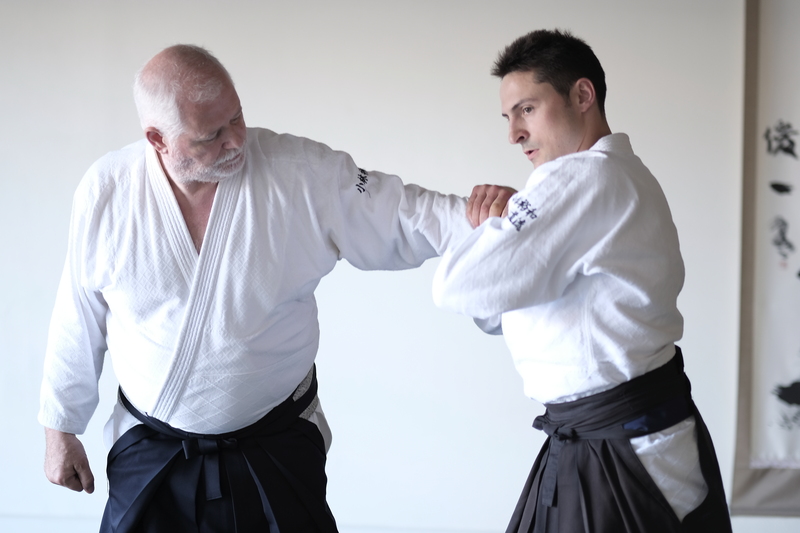 It’s a very special technique and reflects something like the true meaning of aikido. 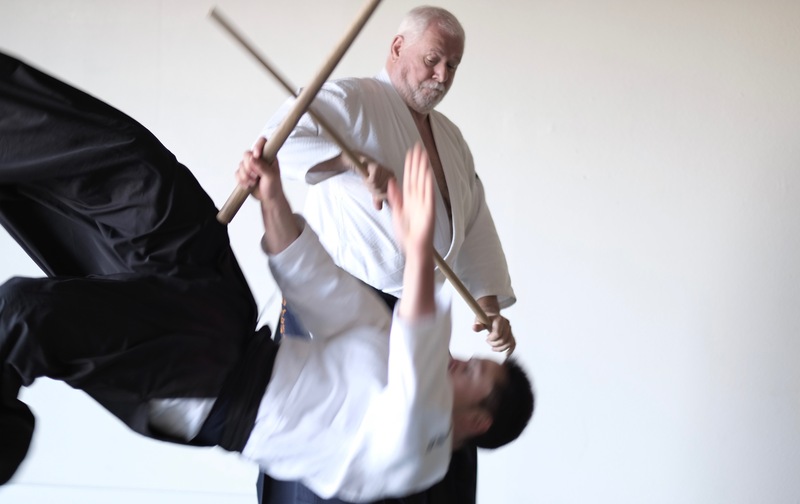 I believe Stanley Pranin said that iriminage was the one of the most original or distinctive techniques in the aikido curriculum. Yes, that’s what Kobayashi Sensei said, too. When you get to higher levels of aikido practice, how much of your training is henka waza-based or how heavily is it emphasized? We do more than henka waza – we do kaeshi waza [countering techniques]. It’s a major part of the practice. Can you speak a bit more about that? For example, an opponent wants to do a nikyo on me. Okay, I let him do the nikyo. I never resist. He wants the nikyo, I give him the nikyo, and then I change my configuration into something else. It’s just like a conversation. It’s very important to preserve the relationship between yourself and the opponent, which turns conflict into a collaborative exploration to find a resolution. There is always a way out that preserves freedom – always. All you have to do is to reach your partner, and reach his heart, in a sense. To get his heart you have to reach his center, but you cannot reach his center if you keep him outside of you. Let him come and let him do what he needs to do. Never resist, and then from there, go on to something else. Interpersonal relationships always have an aspect of conflict, yes? Even from the beginning. People don’t know what will happen, but both want to control the relationship, so even if it’s very friendly, there is always some kind of contest of wills. In aikido, we should accept that unknown aspect and let go of the need for control. Something like, “I don’t know how this relationship will move me, will change me, but I accept it.” It’s just like talking with the body. I’ve thought about this area quite a bit in the last few years. I believe O-Sensei used to say that takemusu aiki was the highest ideal, to be able to spontaneously create the right solution for the situation, and I also realize that for most of us who practice aikido, 90-95% of the time it’s kata-based, a very scripted practice. Most of us see very little kaeshi waza, henka waza, or adaptive practice in our regular classes, so how do you get from here to there if that’s the primary practice method? One very important point in a relationship is that you usually put some kind of limit or constraint on yourself or on the other person and how you interact. You accept a limit or you give your limit. A child will run and do something wrong, and the parents say no so that the child understands his limits. He learns this growing up in certain spaces under the parents’ control, but after a while he becomes an adult who can do this for himself. I don’t ask people to give me their limits; I should give myself the limit, to myself. 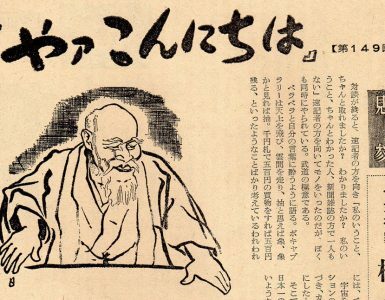 Kobayashi Sensei explained that techniques are always coming from the atemi, always. There is a tension between knowing the atemi I can perform and deciding not to do it, and I let the uke follow that lead. I am giving him the opportunity to react. This is the true capacity of the atemi – of being capable of killing with a sword but choosing not to do it, and by making that choice I express the compassionate position. This position is only possible if the martial part is also expressed. It’s like creating a space for compassion through expressing the martial side of the art. When I move, I must always know what kind of action can my partner do. Here, he can attack. Here, his foot can move. It’s very important to take heed of this and not let it be obscured by fog. If I understand all of these possibilities, I am not in danger, and then I am able to become compassionate. If I feel uncertain and like I am in danger, I cannot be compassionate. The weak point is always dangerous, so if I’m weak in this regard I will be dangerous for my partner and myself. One must first become strong in this martial sense and then develop the compassion. That’s why we do so much weapons training, as weapon mastery is a very big part of developing this intuition. Kobayashi Sensei always said aikido is aiki-jo [aikido jo practice], aiki-taijitsu [aikido open hand practice], aiki-ken [aikido sword practice]. Aiki-jo is about your relationship with the material world and with tactics, taijitsu is about the relationship between humans, and aiki-ken is about your relationship with the spiritual world. All together, it’s aikido. You cannot disregard one – you must keep them all. From aiki-ken, we develop deep internal strategy – the strategy of the mind and spirit. From the aiki-jo, we develop tactics, because we are always able to see the martial aspect. Developing these related disciplines is about trying to never be weak in your relationships, because it’s through strength that we find the capacity to be compassionate. This is our ultimate mission, and while we do not always succeed in it, we try. So within Kobayashi Aikido, some of the defining characteristics are a priority on individual freedom and the idea of thinking about conflict resolution as coming from within yourself as opposed to the opponent. Are there any other distinctive technical elements you’d like to share? Yes, Kobayashi Sensei was always working on combined techniques, or complex techniques that were not part of the normal aikido curriculum. Nikyo, yes, but nikyo-irimi is better. Shihonage, yes, sankyo, yes, but shihonage-sankyo is better. He considered something like shihonage-irimi to be a fundamental technique. So from the beginning, the techniques were more complicated. That’s why in Europe, for example, a lot of people used to say at the beginning, “Oh, Kobayashi’s aikido is too difficult. It’s for more experienced people – it’s too difficult. You cannot begin there.” They wanted a more controlled experience at the start. It’s a little bit difficult at the beginning to understand because you must use your body in a way that doesn’t happen in normal life. All of the movements are new and it’s very interesting because it develops a very special neuromuscular capacity. When you talk about, for example, shihonage with sankyo, are you talking about transforming from one to the other or is it both at the same time? Both at the same time. It’s not going from one to the other, it’s both at the same time. 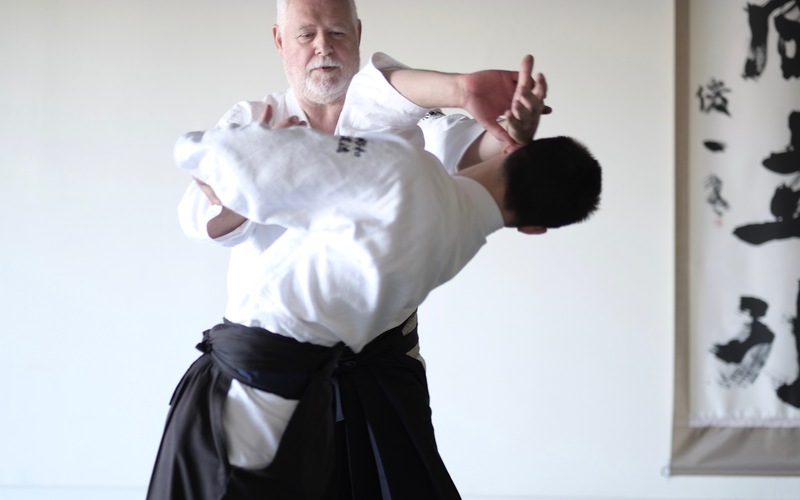 There is a deep philosophical connection here because, for example, if you do a shihonage, you are creating a movement that frees the shoulder from muscle constriction, and when you do nikyo, you are doing something else. With both together, it’s the beginning of freeing your shoulder from other parts of your body. Any part of the body must be free of the whole in order to move in this complex way. This echos the idea of freedom: people must be free. The idea of internal freedom begins effectively in the body. Never be weak in your relationships, because it’s through strength that we find the capacity to be compassionate. This is our ultimate mission, and while we do not always succeed in it, we try. When Kobayashi Sensei was doing his techniques, I felt this sense of freedom. I began to be able to feel it in my body, as well, because he was feeling it and he was awakening this perception in me. He was giving me the consciousness. This step-by-step consciousness contributes to the development of ki no nagare [flow practice]. The action is running in the body, the action is changing and transforming in the body. Ki no nagare is not something external, however, although you can see it there. It becomes possible outside because it happens inside first, when you have internal freedom. This interview will be continued in Part 2, Lighting the Spark. Look for it on Aikido Journal next week. If you enjoy our work, please consider supporting us on Patreon. We don’t generate revenue from ads and need production staff, tools, and operating funds to produce new content and restore and republish content from our vast archive. We very much appreciate your support. Thank you for sharing a very informative interview. Incredibly helpful! Thank you very much! Thank you very much for deep and interesting knowledge. Some information was comletely new for me. I will be waiting for second parts of article. And more information from Andre Cognard. I liked Kobayashi-san’s work. I studied from one of his top students for a while. It can be sometimes painful to learn this style but sobering. I liked the technical aspects and the progressive teaching method. It was heartening to read this article and to finally understand the reason behind it all: “freedom.” Wow. Interesting. Most interesting. 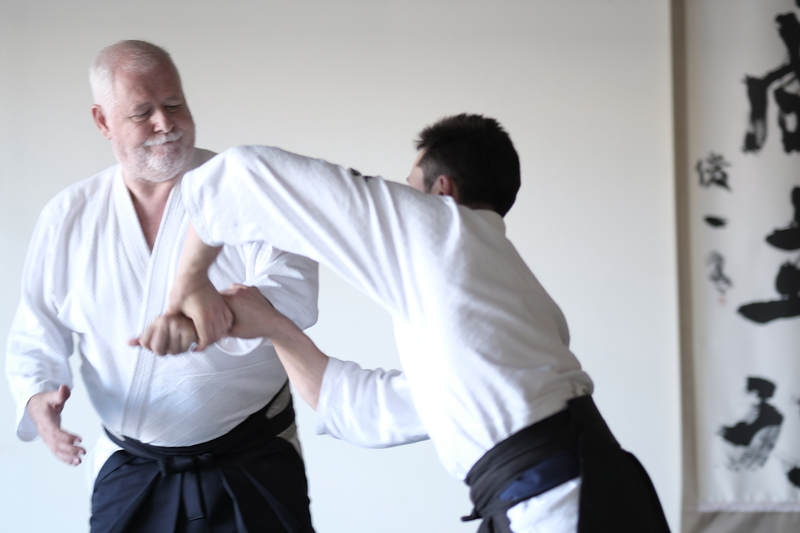 A very Western idea brought into aikido. Well, this development must be partly due to the influence of the man who founded it. Ueshiba says: “Be creative with it…” and here we all are with so many different takes on it, even our philosophies are so different. Kobayashi-san was a genius of sorts. A very good teacher too by all accounts. And Andre is a very good example of a very good student who became a brilliant teacher. I just loved this article and I love his videos online too. What a wonderful view, thank you so much for sharing.